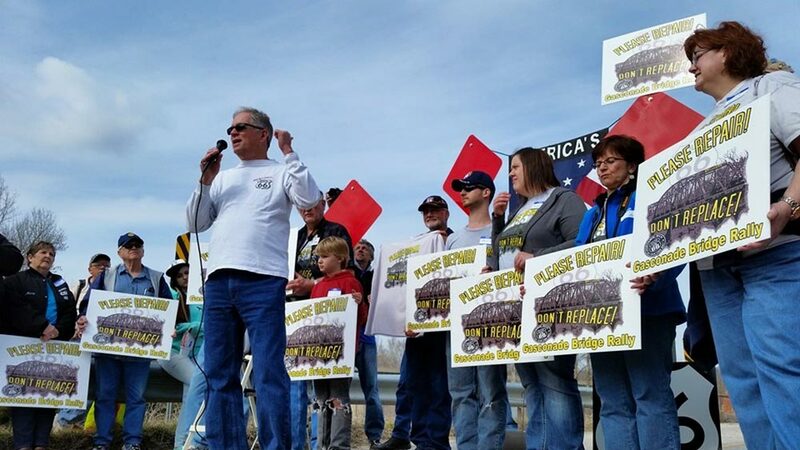 The Route 66 Gasconade River Bridge Guardians have been fighting hard to appeal to MODOT about a bridge that was closed 2 years ago near Hazelgreen, Missouri. Both parties have been working together and within their own organizations to bring together a solution that will provide a safe thoroughfare for motorists, yet still provide the charm and historical features that have adorned this section of the Ozarks for over 90 years. One popular idea that is both practical and cost effective is to bypass the bridge with a spur in the existing roads alignment. 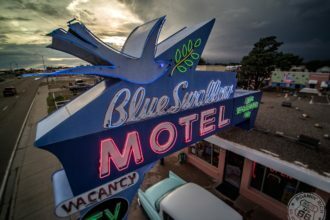 This would isolate the existing steel truss bridge that has been in place for over 90 years; giving Route 66 tourists the opportunity to have a unique experience along the byway. Tourists will be able to stop and walk across the bridge and explore the beauty that surrounds it. 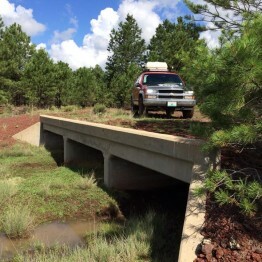 A major caveat in this scenario is that MODOT would seek to remove the bridge from it’s inventory meaning that another entity such as Laclede County or The State Parks system would need to take ownership. MODOT would also give the bridge away to a private organization. Another popular idea aims to repair and rehabilitate the existing bridge and put it back into use. This was the original motive for the guardians. According to a pole by the Lebanon daily record this seems to also be the most popular desire by Lebanon residents. 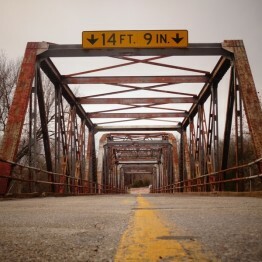 This would keep the bridge apart of Route 66 and in MODOT’s inventory. There are some downfalls with this option though. This section of road is also supposed to support I-44 as an incident bypass route. The bridge is very narrow by today’s standards. Putting the bridge back into use exposes it to potential damage and wear that could jeopardize it down the road. 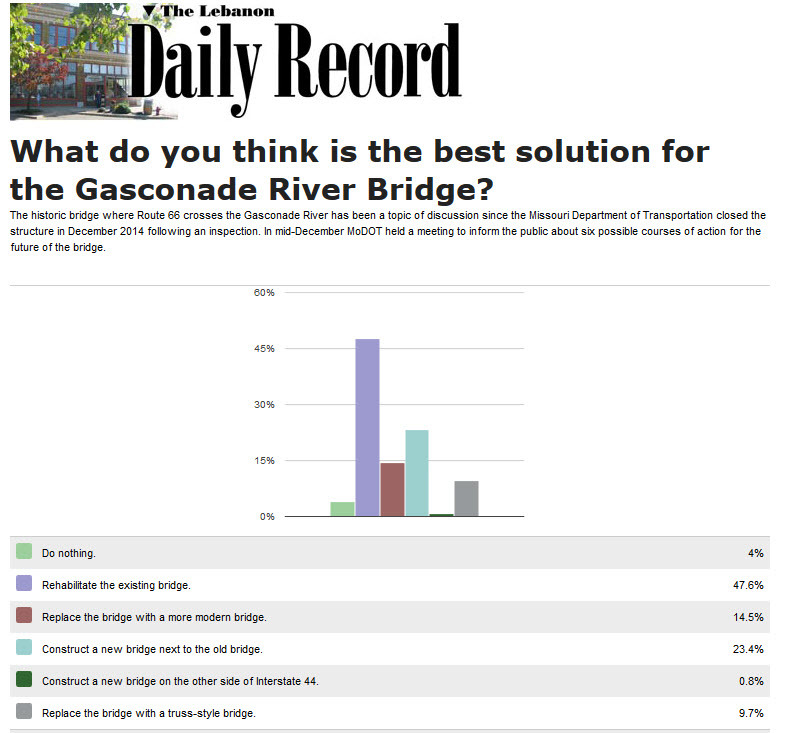 Regardless of the two above methods for addressing the bridge, it seems unanimous. People want the bridge to stay. Here’s how you can help! 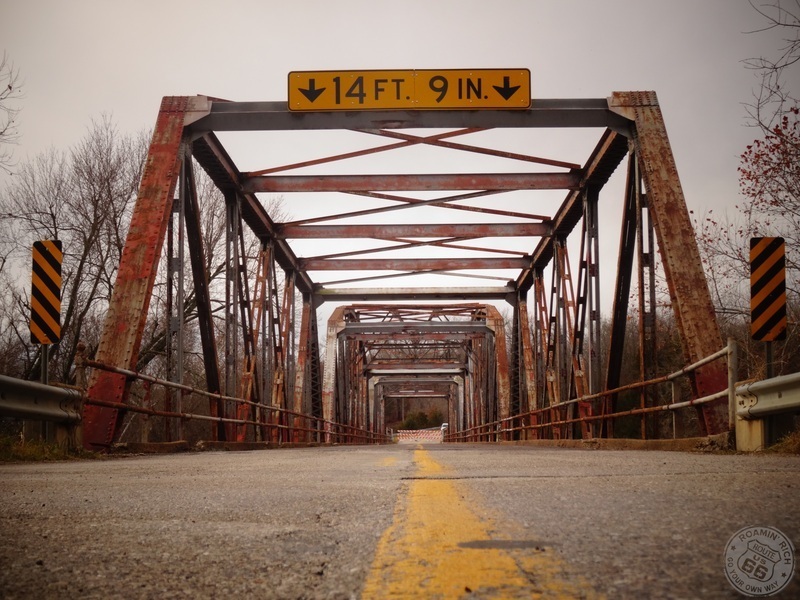 Go to this link: SAVE THE GASCONADE ROUTE 66 BRIDGE – Take just a couple of minutes to explain how important this bridge and Route 66 are to you. 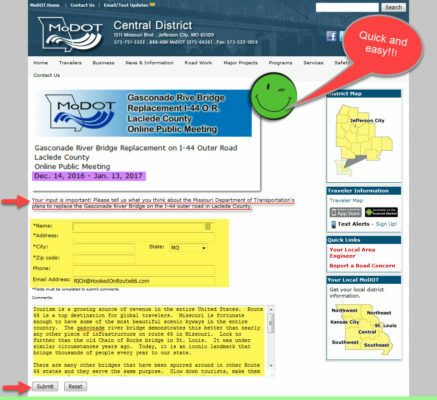 Recommend to MODOT what you believe they should do. Below, you’ll see my comments to MODOT. Personally, I believe MODOT should bypass the bridge and make it apart of a state park. Already, there is a conservation area below the bridge. Both could be incorporated into a park with informational kiosks, picnic tables, a festival area, and resources for bicyclists, fishermen, tourists, equestrians, and anyone else exploring the area. Tourism is a growing source of revenue in the entire United States. 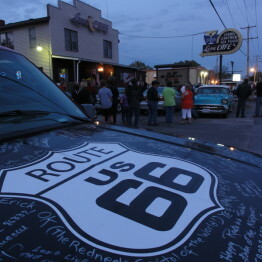 Route 66 is a top destination for global travelers. Missouri is fortunate enough to have some of the most beautiful scenic byways in the entire country. The gasconade river bridge demonstrates this better than nearly any other piece of infrastructure on route 66 in Missouri. 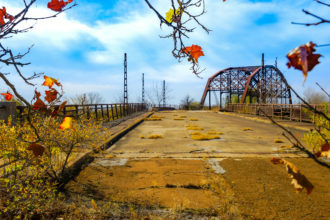 Look no further than the old Chain of Rocks bridge in St. Louis. It was under similar circumstances years ago. Today, it is an iconic landmark that brings thousands of people every year to our state. 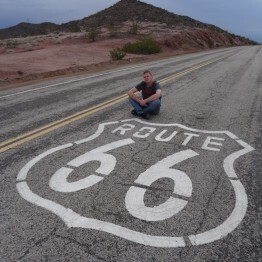 There are many other bridges that have been spurred around in other Route 66 states and they serve the same purpose. 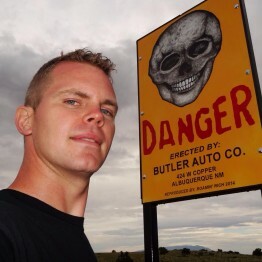 Slow down tourists, make them stop to explore, and they will spend money in the neighboring towns. In the 2 years the Hazelgreen bridge has been closed, tons of people are stopping to explore it, walk it, and experience it. 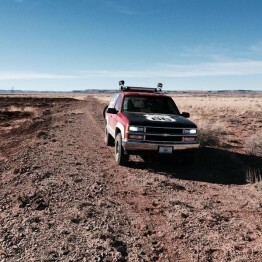 Bicyclists are still utilizing it as a route 66 thoroughfare. This bridge has useful life in it. People want to see these iconic figures of craftsmanship. As a tourist it doesn’t cost you much and you get to touch and experience the past. It’s a feeling you can’t get by going to a baseball game or by riding a roller coaster. Our past is awesome and people deserve to see it! Thanks for reading, but you’re not done yet! 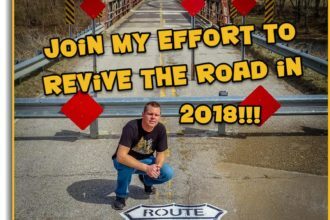 – After you have made your comments to MODOT about this Route 66 landmark, please share this post so that others can participate as well!